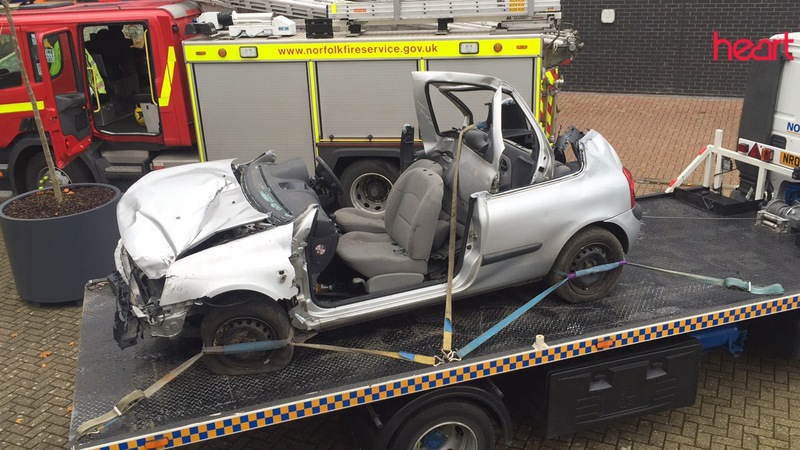 Heart's been speaking to a young driver who was nearly killed in a serious crash in Norfolk 4 months ago. 18 year old Thomas Semmons suffered serious injuries when he lost control of his car in bad weather on the B1145 this summer. He's now the face of a new road safety campaign that's been launched by Norfolk's Police and Crime Commissioner this week. The car Thomas was driving (pictured) will play an important part of the #Impact campaign, touring schools and colleges in Norfolk. During the campaign each student will be given a pledge card and asked to sign it as a personal commitment to road safety. "I promised to do all I can to prevent young people from being seriously injured or killed on our roads. Young people don't want to listen to an old man in a suit, so I have asked Thomas Semmons, who was involved in an accident himself, to talk to young people about the dangers, whether it be drink and drug driving, not wearing a seatbelt, using a mobile phone or speeding. "Thomas is a perfect ambassador for the #Impact campaign and I am very happy that he has agreed to share his experience with the young people of Norfolk. "The #Impact campaign will continue throughout my time as PCC, with updates based on the feedback we receive from our audiences. I want this to be a sustainable effort to display the consequences of not taking road safety seriously." The campaign is actively supported by Norfolk Constabulary, Norfolk Fire and Rescue Service and the East of England Ambulance Service.